I listened with great interest to Peter Bennett's account of him learning to ring at Wootton Wawen surrounded by certificates of the old Guild hanging on the walls (see Report of the Annual Dinner), as I, too, learnt to ring in a similar environment. There were four such certificates hanging on the wall at Ebrington then (there is only one now), and therefore, in the same way as Peter, my first contact with a ringing association was the Four Shires Guild. At that time Harry 'Chinny' Baker was still ringing there. He was an old-Guild member dating back to the early 1920s. Occasionally he might mention the Four Shires Guild (I probably asked about it) and very occasionally he might give it more than a mention, but little more. I did, however, hear just a mention of 'The Shield', but that it had disappeared. The next time something about this almost mythical shield popped up was when I rang at Moreton for the first time. Harry Baker was pointed out to me on the old photo of the Guild hanging in the Ringing Room. On it was The Shield (the photo of it here is an extract from that photo. This is the limit of enlargement before detail quality is affected). The refounding of the Guild in 1973 brought the possessions of the old Guild into greater focus. Very happily the Spencer Jones Cup was discovered early on. Since then we have had the Old Minute book returned. What priceless treasures these two items are! The Challenge Shield (to use its full title) was the award given to the winners of the striking competition. The Old Minute Book provides sufficient material to allow its early history to be discovered. Sadly, the Shield remains lost. This is a great shame, as the Old Minute Book gives sufficient information to confirm the rumours that it was additionally a Memorial to Guild members killed in the Great War (WW1). And so ends the Old Minute Book on this subject. Very sadly we don't have the continuation book, but the main information about the Shield and its purpose as both a memorial and a prize for the Striking Competition winners is there. The accompanying photograph shows it was a wonderful thing. Very few ringing societies have anything quite like this. The obvious question is: where is it? Very sadly we don't know. We do know the Old Guild petered out in either the late 1930s or the early WW2 years, in the latter case probably due to the wartime ban on ringing and concurrent call-up of young men to the forces. It's very likely the Guild's possessions stayed with the people who had them when it all ceased. This certainly happened with the Spencer Jones Cup (found in the village that won it last) and probably the Old Minute Book. This might have happened to the Shield, too. I have tried to discover which team won it last. Without a Minute Book for that period, this is difficult. 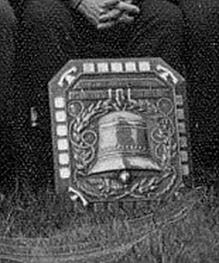 However, Len Dowdeswell, Ringing Master at Stow-on-the-Wold for a long time, wrote a short history of the Four Shield Guild. It is a photocopied manuscript publication and had limited distribution locally. In addition to some notes from Tony Brazier, Len says the Shield and Cup were last competed for in 1938, when Mickleton won the Shield and Great Wolford won the Cup. Two stories circulate as to what eventually happened to the Shield. The first is that it was put in a large chest in the Church — but this referred to a chest in Ilmington Church, not Mickleton (although there has long been a close working relationship between Mickleton and Ilmington ringers). The second is based on a note made by me when I was talking to someone about it — and I can only imagine it was Tony Brazier, who had asked me to write an article about the Guild in conjunction with Len Dowdeswell for a forthcoming item in The Ringing World. I had a list of questions, one of which was, 'Shield — last time it was seen?' The note regarding the answer I received was, 'Mickleton, early 1950s; Church at Mickleton. Peal was rung; Fred didn't want the responsibility.' I'm pretty sure 'Fred' was Fred Kinchin (but I'd like to know if I am correct in thinking this); and I guess he didn't want to take responsibility for keeping the Shield. I tried to follow up this story by finding if there were any survivors of a peal at Mickleton in (probably) the early 1950s in which Fred rang. I found one. Don Niblett was a survivor. I rang Don, but he had no recollection of the Shield being spoken of, let alone seen, so that story hit the buffers. Of the former story 'the chest' in Ilmington Church was opened and searched some years back, but nothing was found. In addition, John Kinchin (who is no direct relation to Fred Kinchin incidentally) said the likely places in Mickleton Church had been searched in the past, but nothing was found. Other possibilities must be considered, the most dreadful of which must be: was it stolen and then melted down for its metal? It is difficult to understand how anybody, even a thief, might do this to something that was a memorial to Fallen ringers (now possibly; but then?). There is another possibility. It comes from a very interesting story told me by David Hart. Harts Silversmiths (aka The Guild of Handicrafts) in Campden held a centenary exhibition in 2002. In preparation for this they were sifting through some drawings and came upon one of a cup made for the Derby Rowing Club. It stood about 18 ins high. Their engraver at the time was from Derby, so he asked if he could take the drawing to show the Club, which, happily, was still in existence. They knew nothing about the Cup and were greatly surprised. Very luckily, somebody mentioned it to an old member. His reply astounded them: “Ah! I'd forgotten about that Cup. It's been in my bank vault for 50 years. I'd wondered what to do with it.” And so, a forgotten and very valuable item (worth about £25k!) came back into being. It was on display at the centenary exhibition. Is the Challenge Shield still in existence? If so, it really ought to see the light of day again. Could we have a thorough search of lofts, chests (church and private) and even in places that don't seem obvious, for example bank vaults!! The Guild is extremely lucky to have been given the Newing Shield as a replacement, but it would be truly wonderful to have the Challenge Shield, too. David Hart tells me Harts Silversmiths are sifting through their many thousands of drawings to form a database for historical purposes. They haven't found the Shield drawing yet, but must be getting close. When they do, the Newsletter will display it.